Springfield, IL (November 9, 2016) – The 2016 NHRA Mello Yello Drag Racing Series comes to an end this weekend at the NHRA Auto Club Finals in Pomona, California. 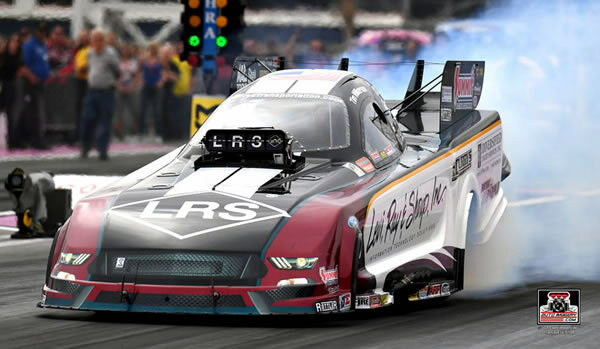 Nitro Funny Car driver Tim Wilkerson is hoping to end the season on a strong note and even move up a couple more positions before the final run down the track on Sunday. The Countdown to the Championship has been a rollercoaster for Wilkerson. He is in ninth place heading into the final race. Nitro Funny Car has yet to crown its 2016 champion. “As a class, Funny Car has had a great season. Several records have been broken, we’ve had several different drivers win and now the points battle is coming down to the very last race. It is very exciting,” Wilkerson said. Wilkerson has been busy in the last two weeks. He’s had his Levi, Ray & Shoup Shelby Mustang on the track making several test laps to try out new parts. Friday, November 11: Nitro Qualifying 12:45 & 3:45 p.m.
Saturday, November 12: Nitro Qualifying 12:45 & 3:45 p.m.
Sunday, November 13: Nitro Eliminations begin at 11:00 a.m.